Test the quality of our service on your Android smartphone. Test the quality of our service on your iphone. Test the quality of our service on your PC. On the next Screen enter your Username and Password (that you received by SMS after your registration for Free trial product) then click on Save. You can now make 30 minutes of free calls to landlines or mobile phone numbers included in our trial offer by clicking on the Vomino Icon on your application desktop. Troubleshooting: Your may get the following message “not registered” Click on the second Icon from your right, When registration is successful, the message 1.1.4 yourPhoneNumber@sipie2.vomino.net is displayed on your phone. The username corresponds to your mobile phone number. 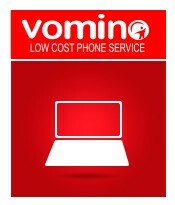 Other Vomino users can call you by dialing this username/number in international format. When you make calls, this number is displayed on the phone of the called party. During your free trial period, you will be able to make calls to any landline phone in Ireland, theUK and every EU country, as well as Australia, Israel, Singapore and Taiwan. In addition, you can make free calls to both landlines and mobile phones in Canada and the United States. PLEASE NOTE! Only Vomino users can call you. Please request one of your friends who is also interested in free calls to take Vomino’s free trial, and you can call each other to test receiving calls. Once you’re happy that Vomino deliver the best phone service at the lowest cost, you can take out a one-year subscription for just €39.95. When you do, we will give you another phone number that can be called by anyone with a landline or mobile phone from anywhere in the world. And the good news is that anyone calling you on this number only pays the normal landline rates charged by his operator. With Vomino’s one-year subscription, you can make unlimited calls to landlines in Ireland, the UK and every EU country, as well as Australia, Israel, Singapore and Taiwan, plus free calls to both landlines and mobile phones in Canada and the United State for a full 12 months. Calls to Irish mobile phones and other destinations that are not included in the subscription will be charged on a prepaid, ready-to-go basis at the lowest prices on the Irish phone market. Top-ups for prepaid accounts start at just €5.00, and you can see a full list of our rates on the Rates Page of our website. to download and install the application (Linphone) required to make and receive free trial calls using your computer. 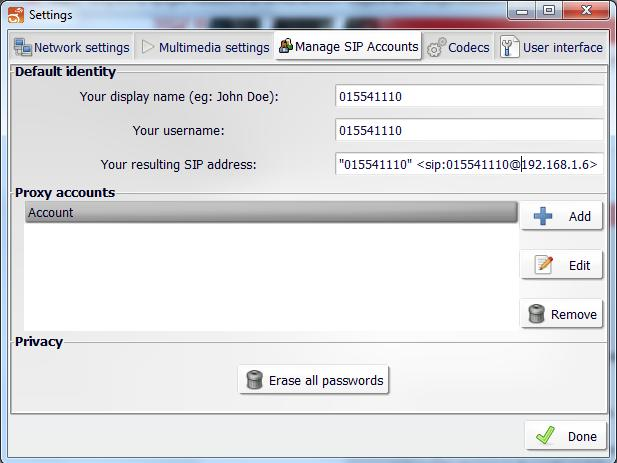 Click on tab Manage SIP Accounts and the windows shown below will appear. 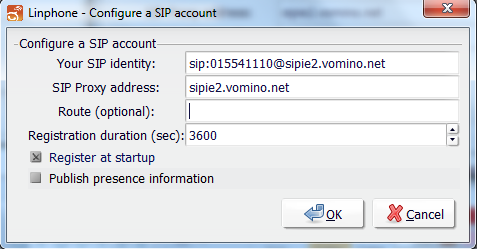 Replace 015541110 by your own Vomino phone number in the field Your display name and Your username. The IP address is added automatically, you do not change it. After completing the above information, you will click on + Add and the windows below will popup. You will replace the information in Your SIP Identity and SIP Proxy address by the information that we will provide by SMS (text). 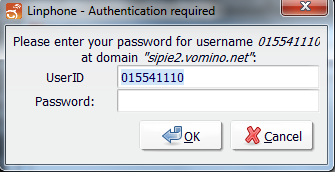 When you finish completing the above information, you will click OK.
A window popup and you have to enter the password that Vomino provide as soon as possible to avoid that the windows will disappear. You will enter the password that we will provide. In case the windows disappear, you have to repeat the above step. Click OK, the configuration is finished. At this time, you will see that registration to Vomino is successful, you can start making calls. The username corresponds to your temporary landline phone number. 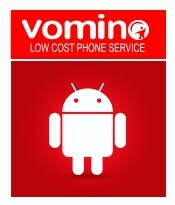 Other Vomino users can call you by dialing this username/number. When you make calls, this number is displayed on the phone of the called party. During your free trial period, you will be able to make calls to any landline phone in Ireland, the UK and every EU country, as well as Australia, Israel, Singapore and Taiwan. In addition, you can make free calls to both landlines and mobile phones in Canada and the United States. PLEASE NOTE! 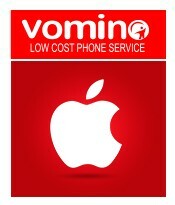 Only Vomino users can call you. Please request one of your friends who is also interested in free calls to take Vomino’s free trial, and you can call each other to test receiving calls. Once you’re happy that Vomino deliver the best phone service at the lowest cost, you can take out a one-year subscription for just €39.95. When you do, we will give you another phone number that can be called by anyone with a landline or mobile phone from anywhere in the world. And the good news is that anyone calling you on this number only pays the normal landline rates charged by his operator. With Vomino’s one-year subscription, you can make unlimited calls to landlines in Ireland, the UK and every EU country, as well as Australia, Israel, Singapore and Taiwan, plus free calls to both landlines and mobile phones in Canada and the United State for a full 12 months. Calls to Irish mobile phones and other destinations that are not included in the subscription will be charged on a prepaid, ready-to-go basis at the lowest prices on the Irish phone market. Top-ups for prepaid accounts start at just €5.00, and you can see a full list of our rates on the Rates Page of our website.